Documentary On Newstalk aired the premiere of 'Willow on Leather' produced by Grainne McPolin on Sunday, 4th February, which explores the story of County Kerry Cricket Club and how the new Irish have helped to bring about a resurgence of this once dormant sport. In June 2017, Ireland was admitted into the pantheon of Test Cricket nations. Along with Afghanistan, Ireland has been awarded full membership to the International Cricket Council (ICC). It was a moment that was a long time coming where Ireland was voted in unanimously to become one of the first countries to be given Test Status since Bangladesh in 2000, bringing the number of ICC members to twelve. Cricket is making a comeback in Ireland with approximately 106 clubs established around the country with about 20,000 people playing the sport now. Reflecting on Ireland's past, cricket had been identified as the sport of the English colonists specifically prior to Irish Independence. Whilst it had occupied a place in Irish heritage for several generations; and after many decades of dormancy, there's been a resurgence in the sport insofar that many of the 'new Irish' have brought a vibrancy to contemporary Ireland and in this instance, through the game of cricket. 'Willow on Leather' is the story of one such club: County Kerry Cricket Club; located in The Spa, a small hamlet near Tralee, Co Kerry aptly named the Oyster Oval. 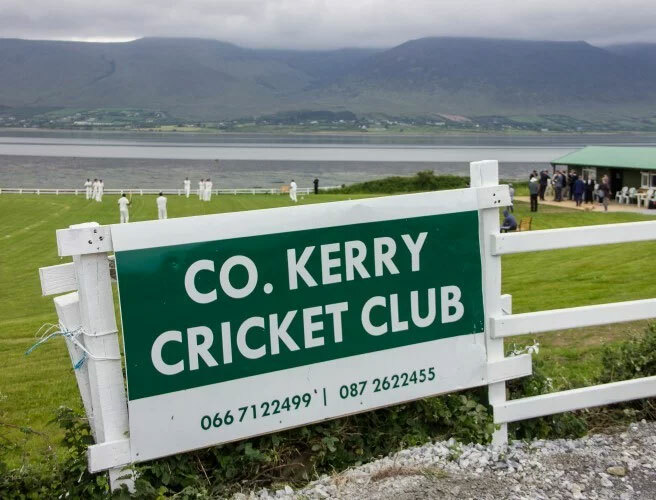 With a membership of approximately 100, County Kerry Cricket Club is a mix of players from India, Pakistan, Bangladesh, Afghanistan, Nepal, South Africa, England, New Zealand, Australia and the local Irish. 'Willow on Leather' is an example of how County Kerry Cricket Club enables the 'new Irish' maintain aspects of their culture within its environs and how they become one family through integration with the locals when they are out there on the ground playing cricket. The documentary captures moments and stories of those making up the cricket team and how it's blended together in team dynamics. The story is a journey undertaken by a few locals to form a cricket club from nothing but determination, the challenges met along the way in finding an ideal location for their home ground and proving that dreams really do come true. Podcast available at: www.newstalk.com/documentaryonnewstalk after the broadcast. 'Willow on Leather' radio documentary was supported by the Broadcasting Authority of Ireland through the Television Licence fee.